I’m pretty happy with my current setup, I may tweak the gain a little to see what happens but all in all I think the performance is pretty respectable considering the environmental conditions. Looking at the Uputronics website, they have two preamps, a regular one and a ceramic one. What’s the difference? My suggestions: Move the antenna outdoors first. See how things change. Then play with the ProStick Plus gain. See how that goes. 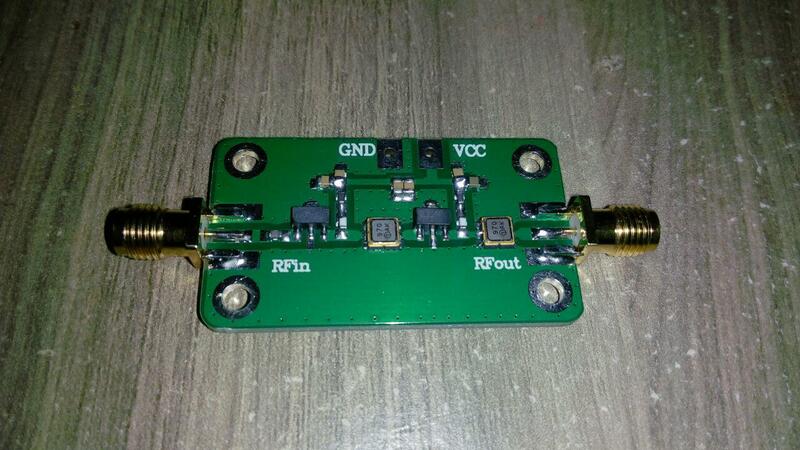 Then purchase an RTL-SDR Blog pre-amp/filter. As for the Uptronics, a ceramic filter may be better in certain cases. If money is not an issue, go for it. If you are an experimenter, a lot can be done with cheap modules found on eBay. I use some of them, and they are fun to play with. Looking at the Uputronics website, they have two preamps, a regular one and a ceramic one. Uptronics offered two Preamp/filter combos. The ‘regular’ and ‘ceramic’ refer only to the filter. The ceramic filter offers more ‘out of band’ blocking and lower insertion loss (both good things). The only downside of the ceramic filter is the price. purchase an RTL-SDR Blog pre-amp/filter. The RTL-SDR filter is a good performer. It uses the cheaper SAW filter, but to improve performance, it uses three of them. The downside of this filter (or upside if you are matching it to their V3 dongle) is that it needs power to be fed up the coax. This is by far the neatest way to power an amp, but does need either an external Bias-T or a dongle that can provide power. Your Pro Stick Plus already has both a filter and amp built in, so unless you are in a very (RF) noisy location, there is probably little to be gained. Put your effort into getting your antenna in the best location you can. SAW filter, but to improve performance, it uses three of them. Two SAW filters behind each amplifier stage, one high pass filter before the first amplifier stage. Complete package is much better at blocking mobile phone towers than the ProStick Plus. But how much you gain in comparison to the ProStick Plus is hard to know until you try because the electrical noise at each location is different. The ProStick Plus has one SAW filter behind the amplifier so depending on the noise in the area (mobile phone towers) its amplifier can get overloaded reducing reception and an external filter (dark blue one for Europe) can help. These two I purchased couple of months ago, but never used. Find many great new & used options and get the best deals for LNA 50-4000 MHz RF Low Noise Amplifier Signal Receiver SPF5189 NF = 0.6dB TW at the best online prices at eBay! Free shipping for many products! Find many great new & used options and get the best deals for RF Divider Biaser Bias Tee 10MHz-6GHz for HAM radio RTL SDR LNA Amplifier 50VDC at the best online prices at eBay! Free shipping for many products! Actually I made a mistake to buy such a wide-band rf amplifier. It will boost FM, TV, Cell phone signals, and cause cross modulation as well. That is the reason I did not use it. Working frequency: 1090MHz (ADS-B receiving special). amplification gain: 38dB. special design: double filter structure is adopted to ensure enough suppression of out of band signal and effectively improve the signal to noise ratio. And you already have a bias-t as i saw in the other picture. I use one of these wide-band eBay amplifiers. Actually, one worse than the one you purchased, which I also did, but have not deployed yet. When combined with the eBay filter, it works OK, at least in my location. I would tried it. As for the other one you asked for input, it’s basically the wide-band amp with the filter on board. I prefer the modules separate for more flexibility, this is why I did not go for it. I have a suspicion this is the RTL-SDR Blog generic amp sans case, which I also purchased, before finding the eBay one. That looks a lot like my preamp. I tested this two-stage LNA for a week. The result is worse than a single-stage “noisy” LNA. Experimenting today. Removed the SAW filter at the output. Checked - it became better. Then I removed the second transistor. Left to work this way, the supply voltage - 3.8V. It became better, comparable to the “noisy” one-stage. The level of the signal without the second stage fell very much. With two cascades, it was enough to set gain = 15…20 on the dongle. It is now set at maximum gain = 49.6, there is no signal over-power. Thanks @rugomol for posting the link and translation. ADS-B 1090 MHz bandpass filter, now add a low noise amplifier circuit on the same PCB board. 1G-1.2GHz DC 5V Power supply. I saw it sometime ago. I was attracted to it by the filter design. As I mentioned earlier, I prefer separate modules, but what ended my interest, if I recall correctly, was the BW of the filter. It’s close to 250MHz. That said, it’s only $9.99. It may be a pleasant surprise. The bottom PCB is ‘off the press’. The top PCB has been tuned as it was found to be too low.